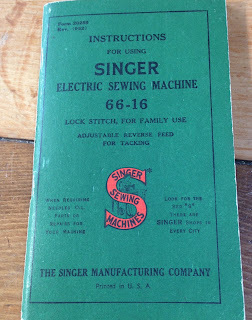 I just slammed my way through a couple of projects, and all of them were done on my Singer 66. 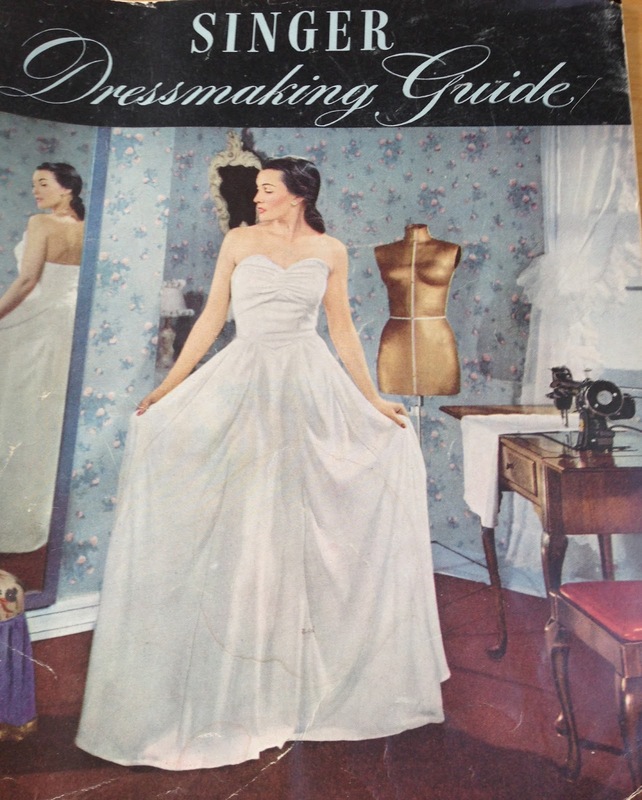 No hiccups, it just sews a beautiful stitch each time. This machine has definitely turned into one of my favorites, and it's kind of funny because I never even planned on using it. She came home with me in a plastic case from a thrift store, at a bargain price. I had a 99K I was organizing, and saw the new looking motor and foot pedal on this Singer in a white plastic hardshell case. I picked up another machine the same day, and didn't even take another look at this one for a few days. When I opened her up and started looking, I saw how pristine she looked. I lifted her up and inside the case was a little baggie with receipts and a perfect instruction book. This machine, serial number AF656090 is made in 1938 or 1940 depending on the reference source. One of the ones I use is ISMACS. 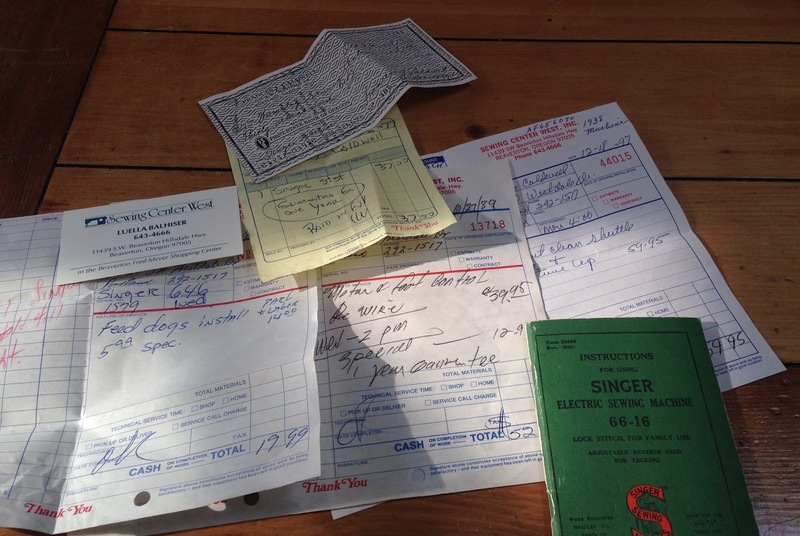 The owner who left all the goodies with the machine, bought her used for $37 in 1977. Close to 40 years after she was made. Then a repair to feed dogs in 1979, replacement of motor and foot controller in 1986, and a cleaning and tune up in 1997. When I saw all that, I had to thread her up and try her. I went to clean out the bobbin case and all the places where dust and lint accumulates, but it was immaculate. A little oil and she purred, and sewed a beautiful straight stitch. I didn't even have to adjust the tension. So I decided I can't take the motor off, and needed to find a cabinet for her. It took a while, but I finally found a Singer Queen Anne cabinet, not the early one with the split top, a bit more recent, but it suits the machine. This blogger http://www.sewalot.com/singer%2066.htm refers to the 66 as being the queen at the time, so I felt the Queen Anne style suited her perfectly. I picked up this vintage booklet, mainly for the picture of the machine and cabinet. My queen didn't come with any attachments, most likely they were with it when it was donated, but that particular thrift store bundles up sewing attachments and doesn't keep them with the machines. If the manual and receipts hadn't been hidden inside the case I doubt they would have been with the machine either. That is the standard set according to the manual that came with it, I have gathered lots of the optional accessories for this machine, but that is a post for another day. 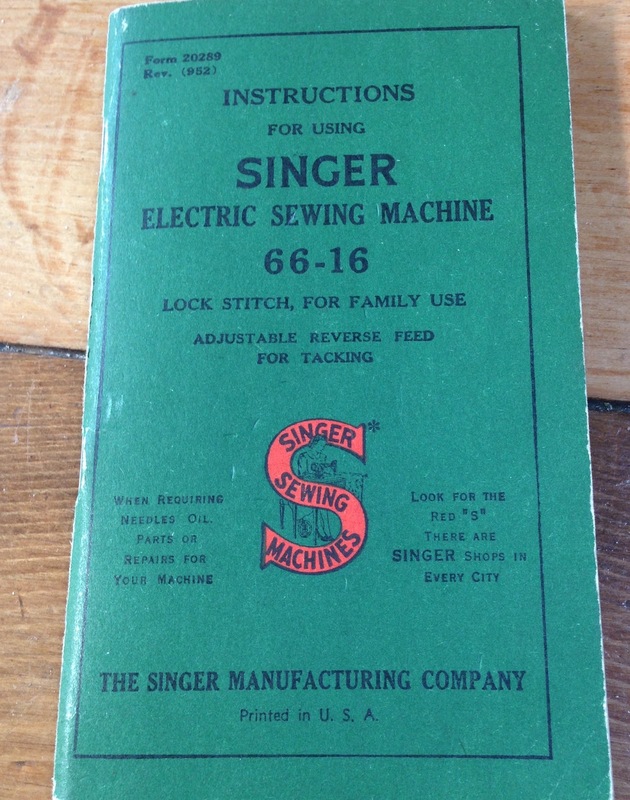 Oh, if you have come across one of these machines, and don't have a manual handy, you can get a free pdf from the singer site. And if you have found a lovely Singer, but are not sure what it is, I love this ID site.